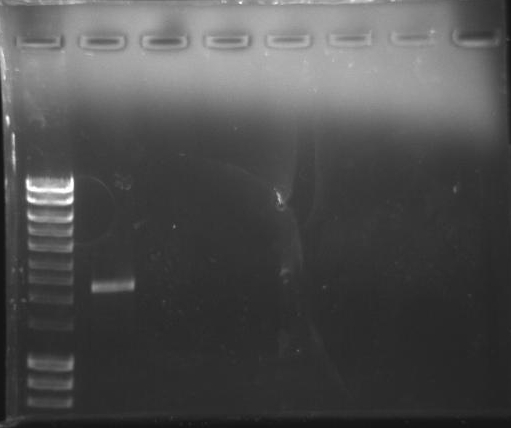 Extracted the PCR products from the gel slices from 20151113 using the QIAQuick Gel Extraction Kit (Qiagen) according to the manufacturer’s protocol. Substituted MiniElute columns so that I could elute with a smaller volume than what is used in the QIAQuick standard protocol. Samples were eluted with 20μL of Buffer EB. Will quantify these libraries via qPCR. 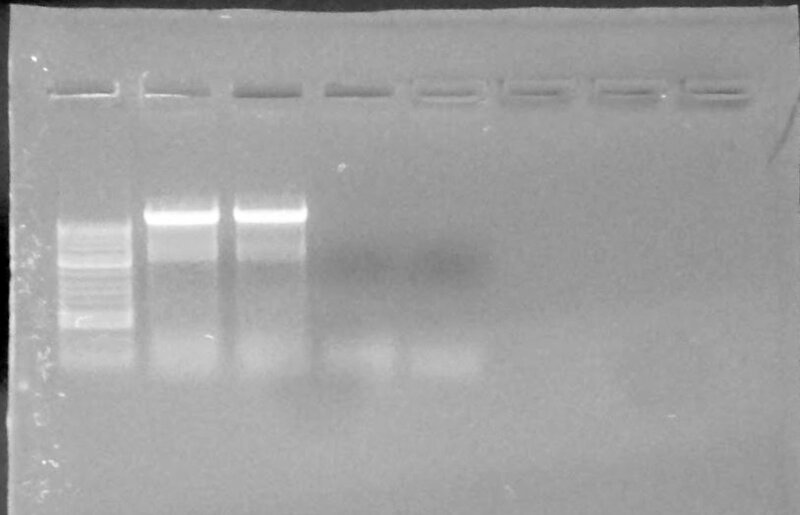 Performed PCR using newly designed primers to amplify the C. gigas hexokinase “promoter” (-2059bp from start) along with a portion of the first exon. Primers used were Cg_Hk_Prom_pBAD_-2059 (SRID: 1518) and Cg_HK_Exon1_R (SRID: 1520). Template used was C.gigas gDNA BB15 (from 20090519; 0.4216ug/uL). Master mix calcs are here. Cycling params are the same used on 20130227. We see a band of >2000bp (that’s the maximum on the molecular weight marker). The bands from each replicate were excised, purified using Ultrafree-DA columns (Millipore) and stored at 4C. Ran PCR to amplify full-length cDNAs of PGS1 & PGS2 (COX1 & COX2) using primers designed to anneal in the 5’/3’UTRs of each isoform. PGS1 primers = SRIDs: 1377, 1378. PGS2 primers = 1376, 1375. Master mix calcs and cycling params are here. cDNA was pooled cDNA made 20110311 from various tissues. 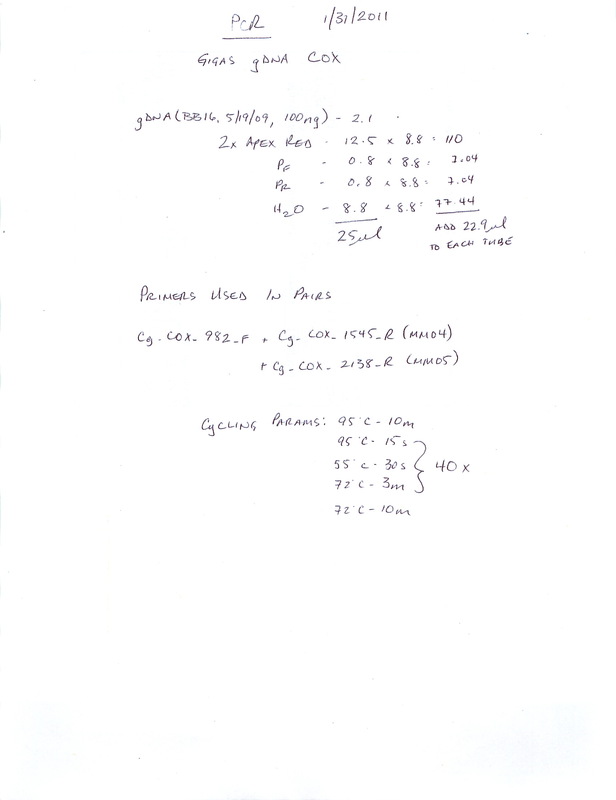 PGS1 Results: PGS1 PCR produces a single band of the expected size (~2300bp), indicating that the two primers, which were designed to anneal in the 5’/3’UTRs of the gene and should be highly specific to just this isoform, work perfectly. The band was excised and stored @ -20C in “Sam’s Miscellaneous” box. 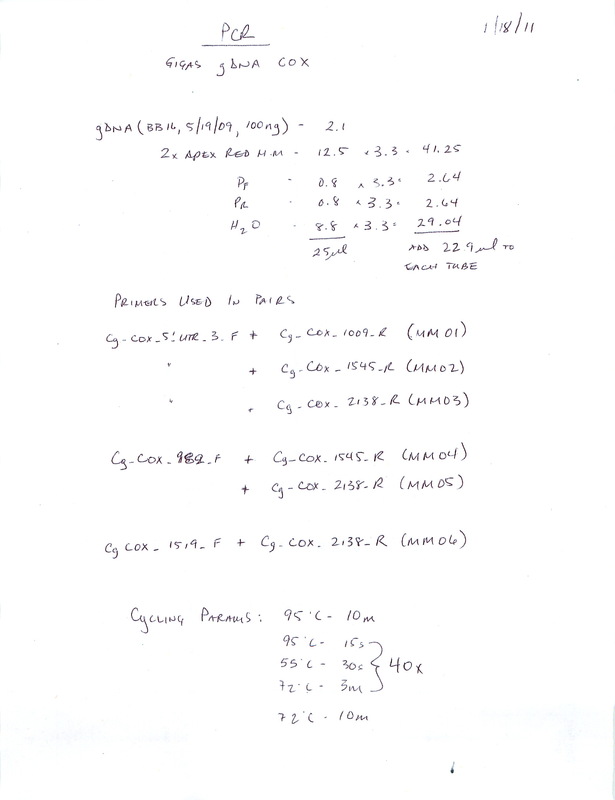 PGS2 Results: PGS2 PCR didn’t produce any product. Will repeat with a lower annealing temp (50C instead of 55C). First of all, we see the appropriate response of each primer only producing amplicons in their respective libraries (i.e. 5′ primer only works in 5′ RACE library). This simply confirms that the primers were designed correctly. Secondly, our negative controls are clean. Thirdly, we get distinct bands from both primers. The bands marked with blue arrows in the image above were excised and purified using Ultrafree DA spin columns (Millipore). These products will be used for cloning and eventual sequencing. Due to the failure of the primary PCR on both 5′ and 3′ RACE cDNA libraries (from 20080619) yesterday, will perform nested PCR using a nested GSP designed by Steven (CgPGSRACEsrNGSP1; SR ID:1209). The 5uL of PCR reactions that were set aside yesterday were diluted to 250uL with tricine-EDTA (supplied with the Clontech SMARTer RACE cDNA Amplification Kit) as instructed in the Clontech manual. The master mix and tube layouts were exactly the same as yesterday’s, but instead of using 2.5uL of RACE cDNA library as template, I used 5uL of the diluted PCR reaction. Additionally, Universal Nested Primers were used instead of the Universal Primer Mix (both supplied in the kit). 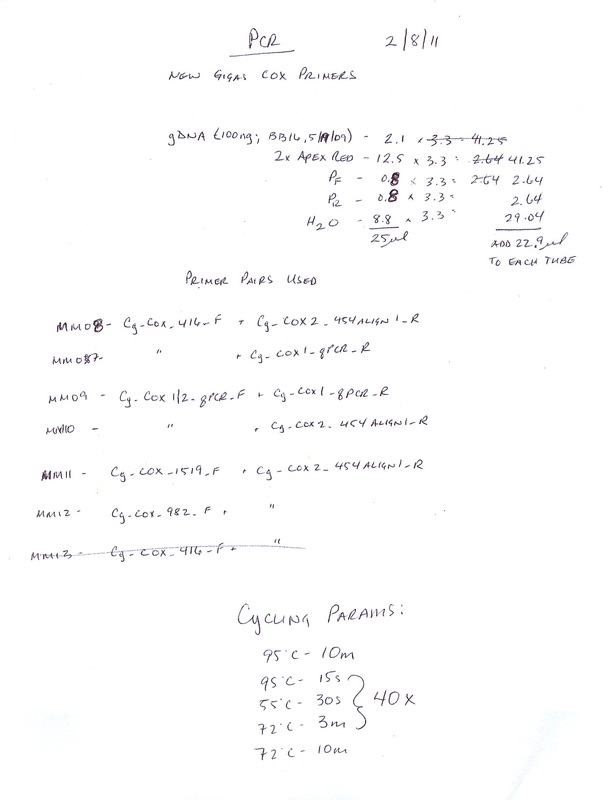 Cycling parameters followed “Program 2″ from the Clontech manual for 25 cycles. 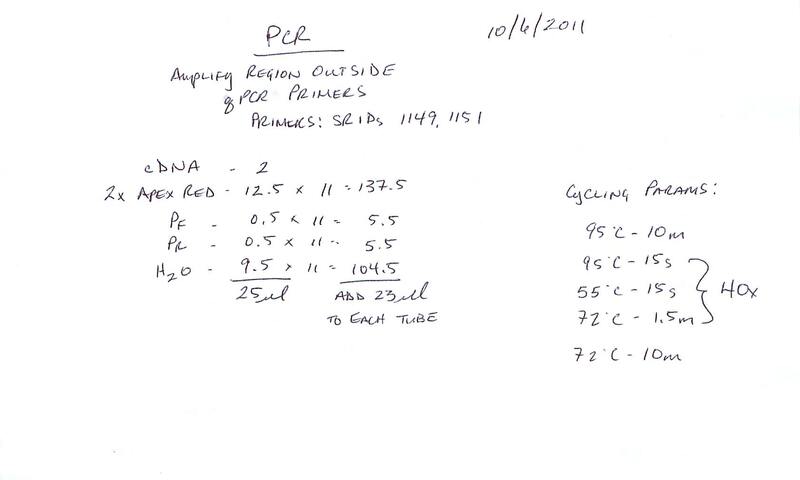 Entire PCR rxns were run on a 1.2% gel, as instructed by the Clontech manual. So….. What we see here is a melted gel! But! We also see a successful PCR! The first three lanes (excluding the Hyperladder I) are 5′ RACE rxn, followed by two different negative controls (the negative control in the last lane is the one we’re really concerned with and it’s totally clean). The next three lanes are the 3′ RACE rxn, followed by two different negative controls (the negative control in the last lane is the one we’re really concerned with and it’s totally clean). As hoped/expected, we got a nice, clear product in the 5′ RACE rxn. The bright band (~1500bp) in the 5′ RACE rxn PCR was excised and purified using Millipore Ultrafree DA columns according to protocol. Will clone and sequence this product. Ladder is Hyperladder I from Bioline. Master mixes are indicated underneath each group by the labels MM##. The order within each MM group (from left to right) is: template, NTC, NTC. All bands boxed with green were purified using Millipore’s Ultrafree-DA spin columns. Samples were stored @ -20C in “Sam’s Misc. -20C Box”. MM07 – Fails to produce any bands of any size. Suggests the presence of intron(s) causing the size of the potential amplicon to exceed the capabilities of the polymerase under these cycling conditions. MM08 – Produces a band of ~400bp which is well below the expected 1540bp (if no introns) size. Due to the faintness of the band, the band was not excised. Will consult with Steven to see if he thinks it worth repeating to produce sufficient product for sequencing. MM09 – Produce a ~500bp band. The band was excised. This band size is ~275bp larger than the expected size of 225bp. This implies the presence of an intron in this region. This band size differs from that produced by MM10, which suggests that this primer set can be used for qPCR AND distinguish between the COX1 and COX2 isoforms. MM10 – Produced a ~700bp band. The band was excised. This band size is ~475bp larger than the expected size of 225bp. This implies the presence of an intron in this region. This band size differs from that produced by MM09, which suggests that this primer set can be used for qPCR AND distinguish between the COX1 and COX2 isoforms. MM11 – Produced multiple bands, of which two were excised; a ~3000bp band and a ~600bp band. These bands were excised solely based on their intensity and their immediate useability for sequencing. Will discuss with Steven on whether or not this should be repeated and the other bands excised for sequencing purposes. Both bands that were excised exceed the expected band size of ~275bp, suggesting the presence of multiple introns. Additionally, the presence of so many products suggests that the primers are not very specific, in regards to their target. MM12 – An extremely faint band of ~350bp can be seen, however, due to it’s faintness and it’s small size (expected size was ~812bp), the band was not excised. Will discuss with Steven to see if this warrants repeating to accumulate sufficient product for sequencing purposes. No amplification of any larger products suggests the presence of introns, causing the size of the potential amplicon to exceed the capabilities of the polymerase under these cycling conditions. This is also confirmed by the MM11 PCR results in which a 3000bp band was produced. Since the primer set in MM12 has an additional 600bp at the 5′ end, this has already exceeded the abilities of the polymerase, even if this addtional 600bp does NOT include an additional intron. However, it is curious that the MM12 primer set does not produce smaller, spurious PCR products as is seen in the MM11 primer set (these two primer sets both use the same forward primer). This was repeated to generate more PCR product for sequencing purposes. 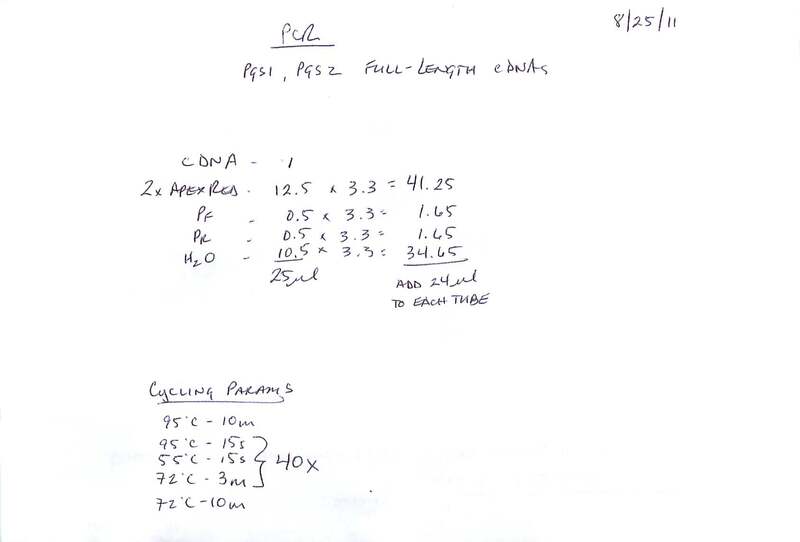 PCR master mix calcs and cycling params are here. 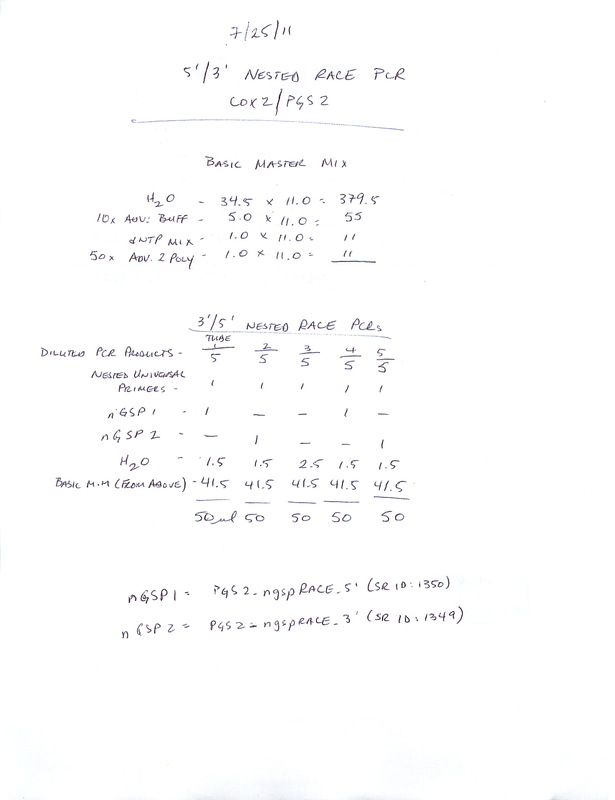 Master mixes 04 and 05 (MM04 and MM05) were repeated to gain more PCR product from the faint 550bp & 1500bp bands(MM04) and 5000bp band (MM05). Interestingly in the MM05 set, inconsistent, faint bands of ~400-500bp are visible. 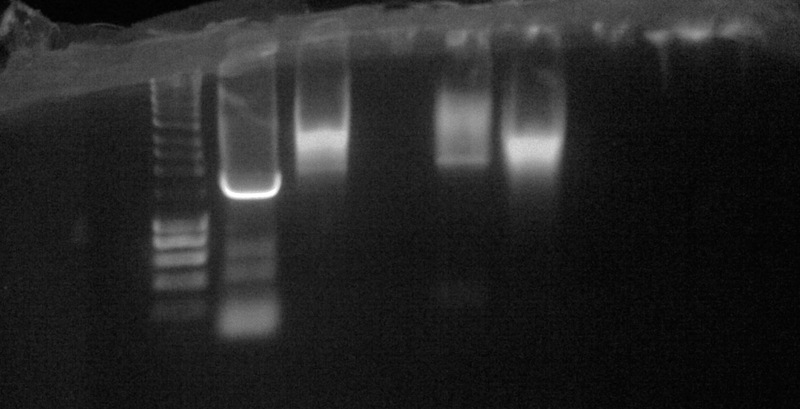 These were not visible the first time this PCR was conducted (see 20110118), but the exposure of the gel image wasn’t turned up as high as in this image. Due to their inconsistency and extremely low yield, these bands were not excised. Bioline Hyperladder I used for marker. Gel is loaded with template samples at the far left of each master mix group with two no template controls (NTC) in the remaining two wells of each master mix group. All NTCs on the gel are clean. All bands surrounded by a green box were excised from the gel. MM01, MM02 and MM03 – The smallest expected band (i.e. no intron present) would have been 1000bp in MM01. Instead, we see faint banding of multiple sizes less than 1000bp in both MM01 and MM02. MM03 fails to produce any bands. This potentially suggests a couple of things. 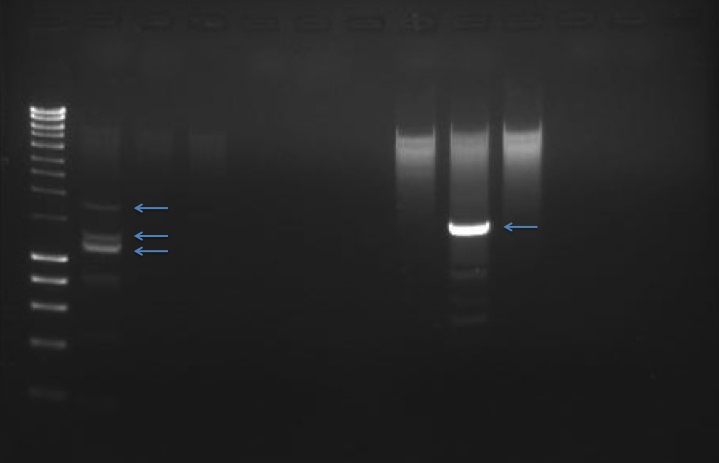 Firstly, the multiple banding produced in MM01 and MM02 suggests that the PCR conditions lead to some non-specific priming and should be optimized. Secondly, the fact that no bands were produced that are equal to or larger than the “no intron size” suggests that intron(s) may exist in the 5′ region of the COX gene and are large enough that the polymerase had insufficient time/ability to amplify. MM04 – Three distinct bands were produced: 2000bp, 1500bp and 550bp. The size of band that would have been produced had an intron NOT been present would have been ~550bp. A band of this size was produced in this PCR reaction. However, two additional bands were produced. The presence of these two larger bands lends additional evidence for the existence of multiple isoforms of COX (which is also supported by the fact that multiple isoforms of COX are known to exist in most other species). The 2000bp band was excised and purified with Millipore Ultra-free DA spin columns and stored @ -20C until a sequencing plate is readied. MM05 – A distinct band of ~5000bp was produced. This is significantly larger than the “no intron size” of ~1130bp, suggesting the presence of an intron. This band was excised, but not purified due to the low concentration of DNA in the gel. The gel slice was stored @ -20C until this PCR reaction could be repeated to accumulate sufficient product for sequencing. MM06 – A distinct band of ~2200bp was produced. This is significantly larger than the “no intron size” of ~620bp, suggesting the presence of an intron. The band was excised and purified with Millipore Ultra-free DA spin columns and stored @ -20C until a sequencing plate is readied. The PCR reactions reveal the presence of intron(s) in the COX gene we’re investigating as well as providing evidence for the existence of multiple isoforms in C.gigas. Since the PCR products that have been excised for sequencing are so large, additional primers will need to be designed closer to the introns in order to generate smaller products that can be fully sequenced. Additionally, all reactions using the primer designed to anneal in the 5’UTR of COX (SR ID: 1150) failed to produce useful results. This is either due to poor performance of the primer under these reaction conditions or due to the presence of a large intron in the 5′ region of the gene. Additional reverse primers will be designed that anneal closer to the 5′ portion of the COX gene in hopes of characterizing the 5′ genomic sequence better. After speaking with Steven today about the potential existence/”discovery” of multiple isoforms, he decided to map the newly-released C.gigas 454 NGS data to the existing COX coding sequence in GenBank (FJ375303). The alignment is shown below. The two 454 reads that map closest to the 5′ end of the COX coding sequence match up nearly perfectly, with periodic SNPs. 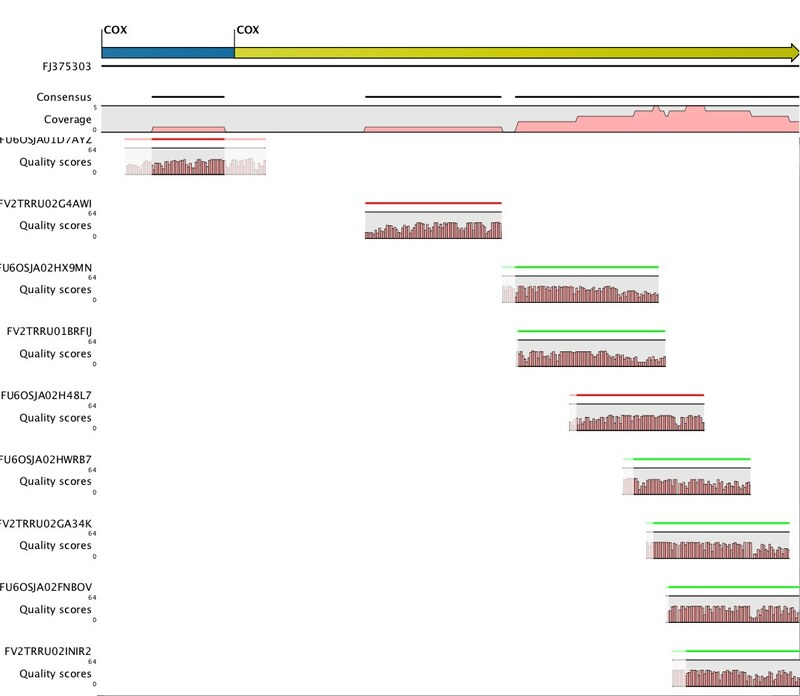 The remaining 454 reads that map to the COX coding sequence are very different and provide very good evidence of a previously unidentified isoform of COX in C.gigas. Primers will be designed from both the existing COX sequence in GenBank (FJ375303) and the other potential isoform. These primers will likely be used in both qPCR and for sequencing purposes, in order to be able to distinguish and characterize both isoforms. Additionally, BLASTing will be performed with the sequences from both isoforms to evaluate how they match up with existing COX isoforms in other species.